This is a general troubleshooting page for the product. If an error is raised before the scanning progress bar disappears, please try to select another scanner interface, if available. Most systems are able to scan through 2 protocols. One is called WIA, the other is TWAIN. AutoSplitter supports both scanning interfaces, but unfortunately on some systems only one of them is reliable. If both interfaces are available on your system, you will see your device listed twice under 2 similar names. Try both devices. Please check the website of your scanner's manufacturer. Your scanner driver might be outdated, installing the most recent version may help. If your scanner connects via wifi, try to make a direct link through cable. See the advice above. Try other scanner sources if possible. Delete file AutoSplitter.ini and restart the program. WIA scanning protocol is limited in terms of available DPI settings. Please try to scan through TWAIN protocol, if available. The software is using a lot of memory during photo detection. This can lead to problems, but there are some workarounds. - Empty your Windows TEMP directory. Check out this article to see how. - Try adjusting Windows memory heap size as described in this article. I recommend a setting of 20480. Warning! This is risky, mistakes during this procedure can break your system. - If you are running version 1.6.5 or earlier, try upgrading to 1.7.0 or higher. Memory handling has been greatly improved in this release. - Please make sure you have write privileges to the output folder. - Run the software as administrator. - Your disk might be full. - Your antivirus software might be blocking write access. Try disabling the antivirus temporarily to verify this. - Try saving files in another format. DPI information of a digital image does not affect its quality at all. This number can be useful if you want to print the digital images. If the DPI is correct, the photo will be reproduced in the correct size. Prior to v1.7.6 only JPEG output files held DPI information. This has been improved in v1.7.6 - JPEG, TIF and PNG files saved by AutoSplitter should hold DPI information now. For other formats this is not supported. 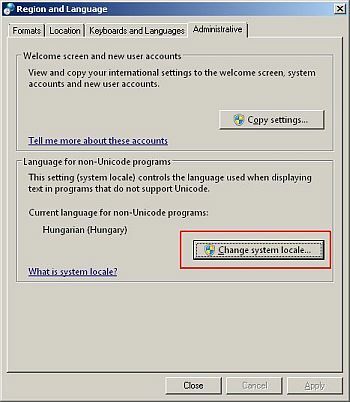 If your system uses non-english file- or folder names, incorrect locale settings can cause trouble. Please try to change your system locale to the correct (non-english) one, for example if you are using hebrew filenames, change to hebrew. See Microsoft's description on how to find this setting in Windows 10. If none of these information helps, the file might be corrupted or locked by another program. When AutoSplitter isn't shut down properly or encounters an issue during batch detection of pre-scanned photographs, sometimes it will refuse to start up properly and/or you cannot exit Batch Review mode. This is fairly easy to fix. This issue will be fixed in version 1.7.5.